So you’ve been dragged into Food Fantasy (Free) through a cutest anime icon on the iOS App Store. It’s happened before. Only this time, these feisty guys and gals aren’t people – but food. Food personified; whatever that really means. 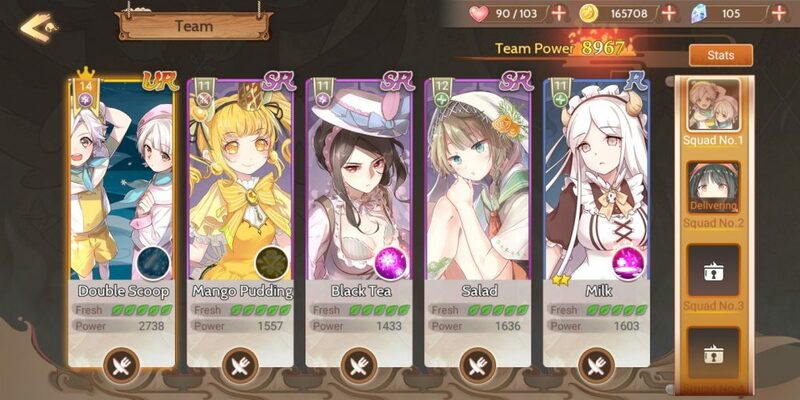 Food Fantasy is a bit of a hybrid when it comes to mobile genres. Mixing turn-based RPG and restaurant management sims together, you get a game in which when you’re not building a team of food-related fighters to fend of food-related illnesses, you’re serving delectable dishes to your customers. Ideally, you want to be doing both at the same time as often as you can, but the sheer amount of systems and currency in play here can be a much for the average fresh ham to handle. Food Souls, Freshness, Ice Arena and summoning; what does it all mean? 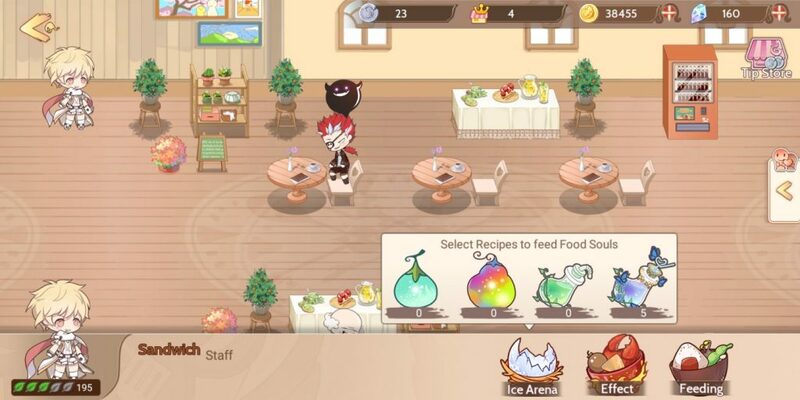 There’s a heck of a lot more to Food Fantasy than initially meets the eye, but hopefully this guide will help put your restaurant on the map. 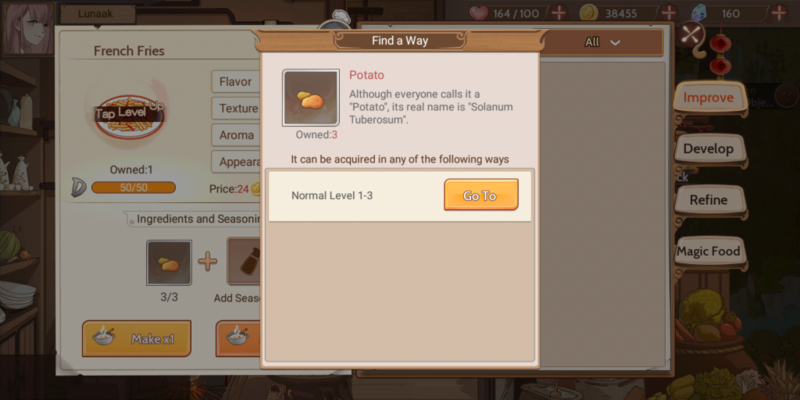 Food Fantasy is all about the grub; so much so that even the anime characters – or ‘Food Souls’ you recruit to your side are all named and themed after certain dishes and key ingredients. As an ‘Attendant’, you’re permitted to summon these Food Souls to fend off the likes of Bulima, Boston Lobster and other such rotten baddies. Outside of battle, they’re good to have around the kitchen! So how do you summon these Food Souls? There’s a number of ways. Food Fantasy keeps the recruits coming in for the first 20 levels or so before slowing down the freebies for those unwilling to cough up the cash. It’s a free mobile gatcha game. You know how these work. Food Souls are summoned primarily from Soul Embers. 150 of these fairly common tokens will get you a single summon from a straight-forward lottery pot of characters. Unlike similar games, there’s no messing around with multiple summon boxes, and no being baited by ‘Increased chance of X character’. Not yet, anyway. 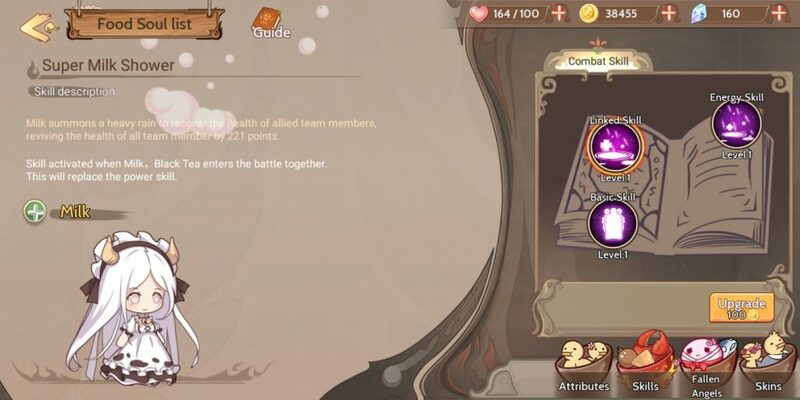 So summon to your heart’s content as soon as you reach 150 Soul Embers, or wait until you have more and summon consecutively; it really doesn’t matter how you do it, the rates of characters and rarities will stay the same. Alternatively, there’s Crystal summoning. As you’d expect, this is summoning Food Souls through premium currency. Rather than 150, however, you only need 100 crystals to do a Food Soul summon this way. The button will ask for 600 if you have that many, but this just summons 4 in a batch rather than giving you a free +1 summon like some other games. As for what to look out for when summoning, Food Souls come in 4 different rarities; M, R, SR and UR. You’d think the order here would denote which are the rarest, but that’s not necessarily the case. 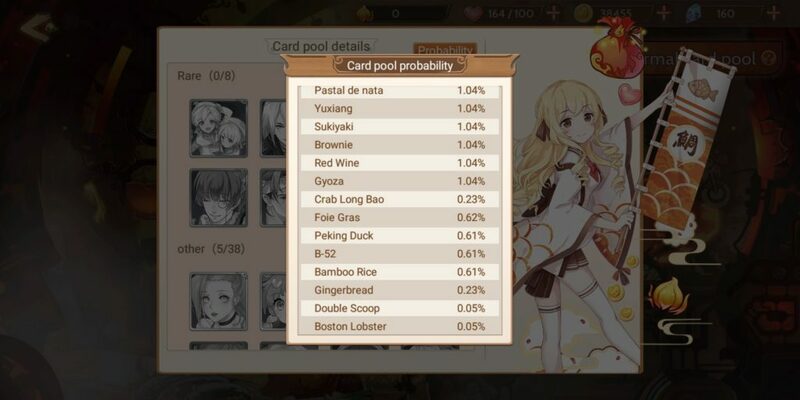 While R, SR, and UR rarity Food Souls are considered Common, Uncommon and Rare, it’s actually the M-type cards that are the rarest; carrying only a 1.85% chance per summon rather than the 3.01% chance on a UR. Getting one of these might make you feel all tingly inside, but they’re not exactly the greatest cards you can find, either. We’ll get into it a little later, but M cards are essentially Restaurant-only characters. You can use them in battle if you wish, but they’re much better suited in your business. The opposite is true for R, SR and UR-rarity Food Souls summoned the same way. When it comes to fighting out in the field, the first thing you’ll need to do it put together a competent team. Teams max out at 5 Food Souls, and which you put in there is entirely up to you. Food Souls themselves fulfill roles on the battlefield, with the icon on the top-left of their card showing which they belong to; Attack, Defense, Magic and Support. Being a 2D RPG, Food Souls take their place on the battlefield depending on their class; like Support and Magic classes filling in the back row, while Attack and Defense characters line the front in combat. Trying to power through a fight with nothing but attackers likely won’t work out too well (unless you’re fighting a mimic chest), so striking a balance between offense and defense will typically be the way to go. Challenges imposed by select stages may require you to break this general rule of thumb, but they’re typically option goals designed for the master strategist to extract the best rewards. As you’d expect, it’s the front line Food Souls who’ll be taking the heavier hits. Backing them up with Support characters will help keep them healthy, whereas Magic characters offset their low defenses by casting high-damage spells from a safer place. Combat in Food Fantasy is semi-automatic and it isn’t really turn-based at all. Food Souls and the Fallen Angels they fight all attack at the same time until either side is wiped out. But it isn’t an idle battle system, either. As they all fight each other, various battle resource bars fill up, like points used on Cooking Talents or meters depicting when a Food Soul’s ‘Link Skill’ is ready to rock. There’s plenty of these that you’ll learn and upgrade with Cooking Points, and range from Support skills like shields and heals, to fire dropped on your enemies and stuns designed to slow them down. On the right side of the screen are ‘Link’ abilities. These are combo skills only become available if certain Food Souls are part of your team; like Milk and Black Tea. You’ll come across these two early in your game, but there’s plenty of other Food Soul combinations available. Some even benefit from a third Food Soul – like Coffee teaming up with Milk. Food Souls aren’t quite as simple as you’d expect. Rather than simply growing in strength as they earn experience points in battle and level up, their power increases in many more ways than simply increasing their level. When it comes to leveling up a Food Soul the old-fashioned way, things couldn’t really be any simpler. All Food Souls used in battle gain a fixed amount (typically 50) experience points, but EXP Potions will be your go-to method of beefing them up. EXP potions quickly amass through regular play and award as little as 4 fights worth of experience for a single character, making the whole process a little less of a grind than most RPGs. You can use these manually for more control, or hit the ‘Upgrade’ button to max them out to your current Player Level threshold. Certain scenarios – like Dine n’ Dash customer battles – won’t award Food Soul EXP. It may be difficult to see in battle, but each Food Soul uses a bunch of different Skills; all of which can be be upgraded as they reach specific levels. Anything other than a ‘Link’ skill is used automatically in battle, with these Link skills needing to be manually executed in battle when the Link character mentioned in the skill description is in battle at the same time. Skills can be leveled up with small amounts of Gold, but will begin to require ‘Seasoning’ as they reach higher levels. A much more infrequent way of powering up your favorite Food Souls is to simple make them like you. Just by using a Food Soul in battle, they’ll gain a tiny bit of ‘fondness’ which, when maxed out, will boost a pre-determined stat by a set percentage. This likely won’t be something you’ll need to aim for until very late in the game, though, as the minor percentage increase won’t amount to much on a low-level character. You can speed things along by feeding your Food Soul a dish from your inventory, so spamming to upgrade a dish in the restaurant has its perks outside, too. Each Food Soul has a favorite thing to eat, so pay attention to this if you want to speed things along. But by far the best – and hardest – way to power up a character is through ‘Ascending’. Ascending is the process of increasing a Food Soul’s star-rating by spending shards corresponding to that Food Soul, with each level of ascension taking more shards than the last. With each level of ascension, it isn’t uncommon to see various stats increase by several hundred, with a Food Soul’s power rating increasing from something like 1800 to 2100 in a single go. There are also some stats that can only be increased this way. 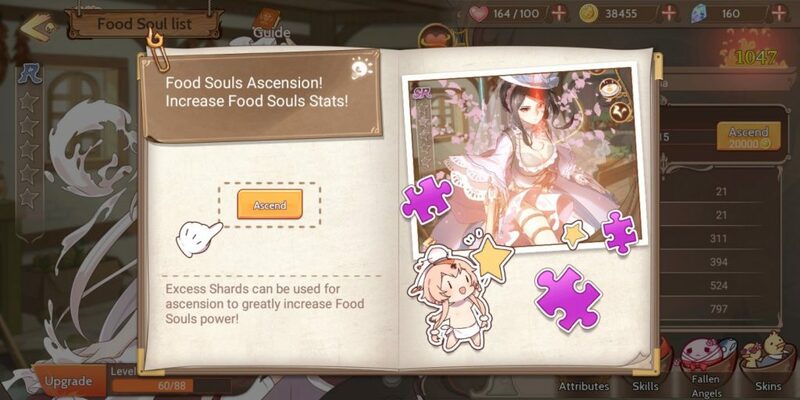 Shards can be had in a few different ways, but pulling a duplicate Food Soul from a summon will automatically convert it to 15 of that Food Soul’s shards. More can be earned through several different in-game activities; like story missions, promotional campaigns and Air Ship trips. 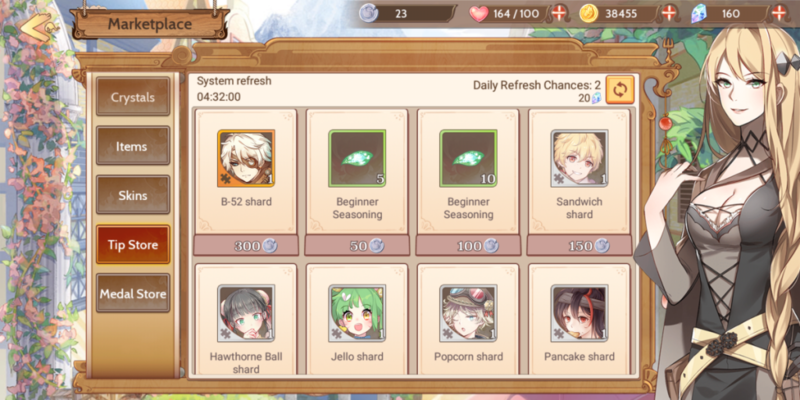 Regular trips to the in-game shop can also act as a way to get specific Food Soul shards more reliably, with Hard Mode missions even having fixed Food Soul shard rewards for each stage; of which can be cleared 3x daily. Food Soul ascension is Food Fantasy‘s primary ‘gatcha’ system and isn’t a fast-track to success, but the many methods available to obtain shards means playing efficiently is the quickest way to reap the rewards. Come for the anime, stay for the restaurant! Food Fantasy is everything you’d expect from a mobile game mixed into one, so it shouldn’t come as a surprise to learn that running a restaurant in Food Fantasy is massive time-sink. Nothing inherintly bad will come if you neglect of forget to prepare a few dozen plates of fries before you head off to your day job, but any time spent not serving customers is time wasted; at least if you’re trying to make it on the week’s leaderboards. 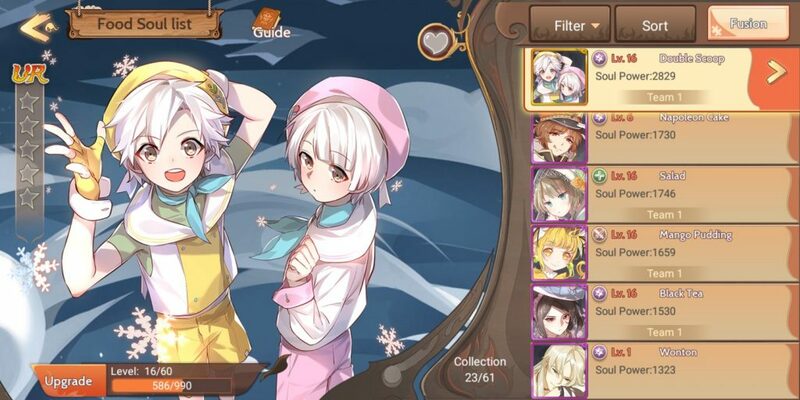 Running a successful restaurant in Food Fantasy is as much a game as the RPG elements – it’s a double-whammy! There’s a lot of elements and statistics in play here, but it’s basically down to how efficiently you use the time you have. Assigning Food Souls to staff your restaurant is the first thing to do whenever you enter the screen. You’ll need to assign a Food Soul to cook the food, and several others to wait the tables and take customer orders. 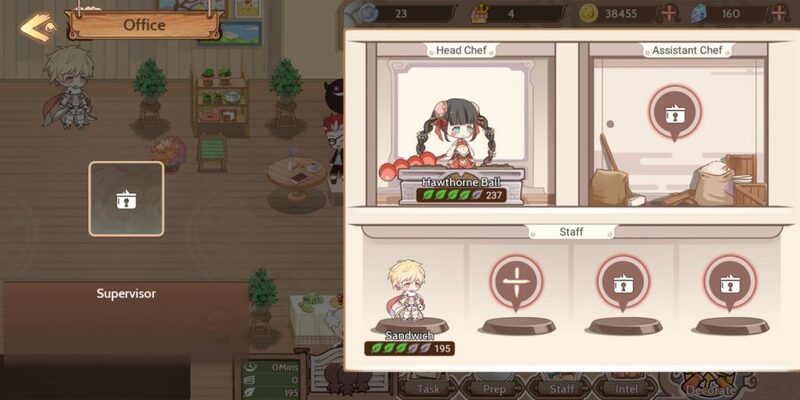 You’ll unlock more waiter and chef slots as your restaurant levels up, but you’ll be stuck with a single chef for a while. Look at your available Food Souls and make note of whether they have the Restaurant Skill tab beside their combat skills, as these specific Food Souls are usually then better suited to working your business. These Food Souls typically have far more ‘freshness’ than combat-heavy Food Souls and thus won’t need to be swapped out quite so often to recharge, giving you more time to focus on other things. They won’t unlock their other skills until you’re able to boost their stars through Ascension, but earning their shards is somewhat easier thanks to the ever-changing stock within the Tip Store typically focusing on Food Souls with restaurant skills. Even just having substantially more maximum freshness can make running your restaurant a much less demanding experience. One of the things that caught me out in the first few levels of Food Fantasy was the ‘freshness’ meter. Every Food Soul has one, and depleting it means they’ll refuse to do anything; from fighting by your side, to cooking or serving customers in the restaurant. The in-game tutorial barely touches on this at all, but with just how freshness is lost working in the restaurant, you’ll find yourself at the mercy of this mysterious meter more often than you might think. Recovering Food Soul freshness can be done in one of two ways – potions, and the Ice Arena. You won’t unlock the Ice Arena until level 16, though, so you’ll have to make do with potions to keep your Food Souls going strong until then. Potions dish out different amounts of Freshness depending on their size when consumed, whereas the Ice Arena has you leave Food Souls in there to regenerate Freshness over time. You’ll start off with 3 Food Soul slots in the Ice Arena, but this can be upgrading with Gold and certain materials just like the restaurant. Freshness is consumed much more quickly through restaurant work than in combat, with deliveries splitting a fixed percentage Freshness penalty between members of the team. ‘M’ rarity Food Souls typically have a far higher maximum Freshness meter that makes them better suited to the restaurant life and can usually be upgraded like any other skill on their respective page, so it’s best to identify which of your Food Souls will keep up the good work in your restaurant for longer if you’re not checking in quite so often. No business is ever completed on its first day, and your restaurant is no different. Dive right in and you’ll notice a bunch of locked restaurant elements; like staff slots, food slots and decorations. All good things come in time, and you’ll have to wait a little while before you can upgrade your restaurant level to access these little perks. The primary resource when it comes to upgrading your Food Fantasy restaurant is ‘Fame’ – a currency awarded at random by customers served in your establishment. You’ll spend this to upgrade your business, but you’ll need building materials, too. The first two upgrades come naturally as you progress the main story, but you’ll eventually have to work for these materials by way of the Air Ship and Exploration activities unlocked at a higher character level. You’ll have a lot of excess Fame as you work up to this, though, so try not to worry about it. Just focus on making sure your customers can eat! During the opening moments of Food Fantasy, you’ll be asked to pick your initial cuisine. This will open up a bunch of recipes for you to learn as the game goes on. Just pick the one that sounds best suited to your tastes, like Gloriville if you’re a fan of meat and fried foods, as you’ll unlock the rest once you fill out the first. You won’t have to spend time washing the dishes in your Food Fantasy restaurant, but you will have to source many of your own ingredients. Rather than grow and harvest them yourself, however, you’ll gain them by clearing certain enemy stages. Farming for ingredient drops is one of the things you’ll do most in Food Fantasy. You don’t need the ingredients to prepare the dish in your restaurant each time, but they’re used to discover the initial recipe and upgrade its quality so that each plate you serve will earn you more cash in return. It will also increase the size of the batches your chef can prepare, so farming for ingredients and upgrading your favorite dishes always has its perks. Each location in Food Fantasy has combat stages, with the next unlocked as you beat the last. Only 2 or 3 of these stages per page can be repeated once cleared, but each is set to drop a specific ingredient or two upon with each clear. Rather than spend time fighting in each stage for a single ingredient, you can use the ‘Sweep’ feature to gather large amounts instantly once you’ve cleared the selected stage for the first time. Other than Food Soul experience points, the rewards remain the same. Tapping a dish will take you to its required ingredients, and tapping those will take you to wherever wherever they can be obtained. 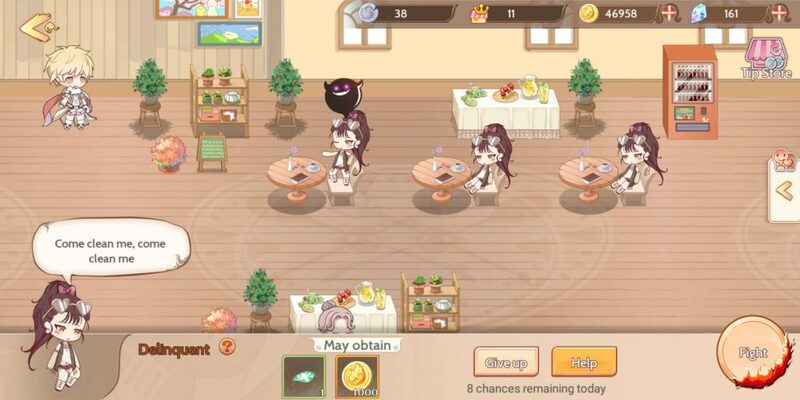 There aren’t many secrets in Food Fantasy; everything is well within reach. Tap, tap, (Sweep) and cook. When it comes to discovering new dishes to serve your customers, the in-game Recipe list is the way to go. You need to ‘develop’ a recipe/dish before you can begin serving it to your customers, but it isn’t quite as RNG heavy as it initially appears. Seasoning can be applied during the Improve process to tweak the stats of a dish further, but you won’t gain access to these for a while. You’ll need to make large batches to rank up a dish, but doing so will increase the amount you can make in the restaurant at once, and the cash you’ll make by selling it. You hold onto dishes made in this way, too, which you can then either use in Delivery or Airship missions, or feed to your Food Souls to increase their Fondness of you – which will eventually further increase certain stats. Serving up fries to your customers will get old fast, but the Develop tab — unlocked at Player Level 5 — allows you to discover brand-new dishes to serve in your restaurant. Greyed out or not, tapping on a recipe typically gives enough hints on how to first develop it. Select the ingredients you think comprise the dish on the develop menu and come back in 10 minutes to see if you were right. Ingredients are consumed in the process, but even a failed attempt will yield Cooking Points you can use to upgrade your battle skills. If successful, you can upgrade and serve the dish just like any other. If you want to bypass the challenge completely, you can look up the details of each Develop recipe on the Food Fantasy wiki. Making all the recipies of your chosen cuisine will unlock the cuisine of other locales. There’s even an extensive list of ‘lost cuisine’ available no matter which cuisine you originally chose. As you’d expect from a free-to-play game, Food Fantasy has a bunch of things you can buy for a mixture of both real and in-game currency. Tapping the Shop icon in the top right of the main hub screen will take you straight there, but a few screens – like the restaurant – will skip to specific tabs of the store designed to help in that situation. We’ve pieced together the table below to help you learn which currency types are used for which goods, and which Shop tab you’ll want to visit to spend them. 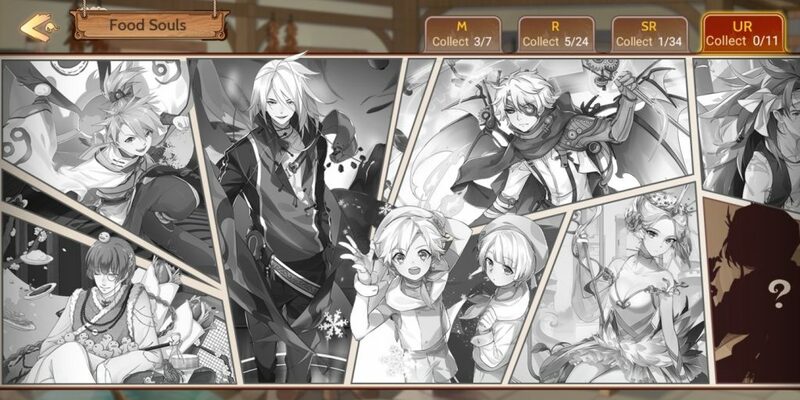 Food Fantasy is a time management game at heart, and even the contents of each shop screen rotates throughout the day. If a particular item or shard isn’t available – or you’ve bought all of the current selection – you can expect to see more several times a day. Just keep checking back and keep an eye on the timer. Stamina Spent on fights and sweeps Typically regenerated over time or instantly through Magic Crystals and Stamina Potions. Gold Common currency of Food Fantasy. Used to cook meals in the restaurant, level up Food Soul skills or buy additional Delivery Bikes Selling dishes in the restaurant, completing Daily tasks and fighting in battle stages. Magic Crystal Premium currency of Food Fantasy. Used to speed up wait times and summon Food Souls. Rewarded for leaderboard rankings or bought with real-world currency. Daily tasks and events and milestones may occasionally award these. Medals Can be exchanged in the Medal Store tab for a selection of rotating Food Soul shards. Rewarded through Showdown matches. Tip Can be exchanged in the Medal Store tab for a selection of rotating Food Soul shards, Food Soul Seasoning and exorcist gloves Gifted by customers as they leave the restaurant. Fame Used in conjunction with construction materials to raise your restaurant level. Each customer has a 10% chance of awarding Fame as they leave the restaurant. Appearance Voucher Can be exchanged for Food Soul skins in the shop. Awarded through various in-game events. Can be reliably farmed on Saturday and Sunday through the Appearance Coupon Supplies ‘Daily Trail’. Cooking Power Used to learn and level up Talents. Accumulated in many ways during regular play; like Airships, quests, deliveries and leaderboard rewards. Food Fantasy has a number of ‘Level Up’ elements that all dictate which features you can access. Player Level increases through just about any in-game action, but others – like Restaurant levels and Food Soul levels – take more targeted work. You’ll see a lot of map and UI elements locked from the get-go, so we’ve put together the following table to show what you’ll unlock as you level up and a brief explanation of why you’ll want to get there. Blank levels award nothing more than Gold, stamina increases, or other small item rewards. The list isn’t complete and only represents what we’ve seen in-game itself, but it should give you a good idea of what to expect as you play. The first table focuses on Player Level with the second focusing on Restaurant Level. 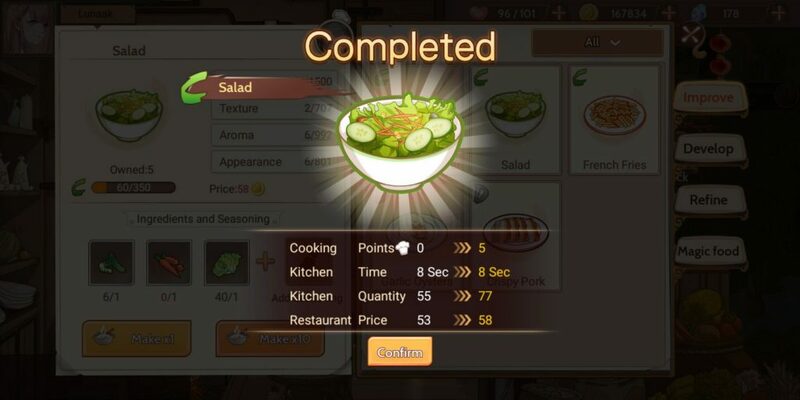 Level 3 Improve Recipe Create the same dish again to increase its rank and rewards when sold in the restaurant. Level 7 Cooking Talents Spend ‘Cooking Points’ to obtain and upgrade skills you can use in battle. Split into Attack, Support and Control categories. Level 12 Hard Mode battles A seperate set of stages on each map geared toward high-level play. Each can be repeated 3x daily for Food Soul shards. Level 13 Daily Missions Repeatable tasks that can be completed once per day for various rewards. Level 15 World Map Journey to other regions to complete deliveries and stage missions. Level 22 Airship Periodically ship large quantities of dishes and items away for various rewards. Level 23 Showdown Fight against AI players for rewards and leaderboard rankings. Send a team of Food Souls out to clear locations and gain rewards like building materials over time. Catacombs: Take 2 teams of 5 Food Souls to fight in a gauntlet-style PvE event. Your highest floor clear count is logged on the weekly leaderboard. Level 28 Marketplace Spend ‘Gold’ to buy ingredients, seasoning and building materials. You can list items for sale, too.